I mentioned in my last post about Harris that two of our companions, Paul & Sue Fisher, took the opportunity to climb Clisham whilst we were out looking for Golden Eagles. Paul has very kindly sent in a piece about this, and a description of climbing Beinn Mhor in South Uist. So if you're taking a few days in the islands, and the weather is kind, here are a couple of hills to savour. Plus of course, for Corbett baggers, Clisham just has to be done. 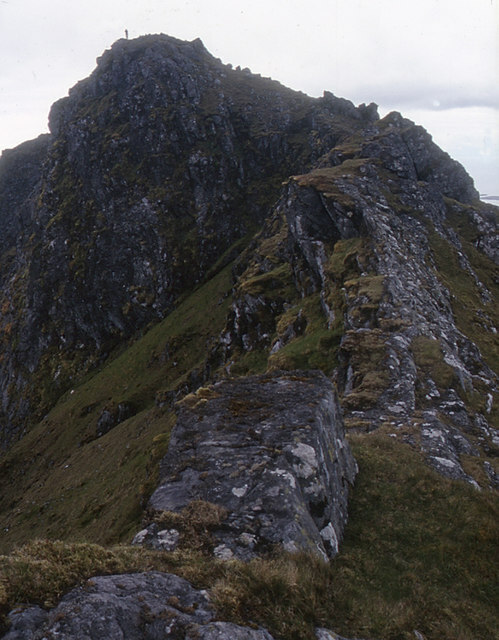 This hill, at just over 2,000 feet the highest point in the Outer Hebrides south of Harris, is a bit like a miniature Ben Nevis. From the south it appears as a big, rather uninviting wedge with a long level knobbly crest: but its north and east side is something quite different....! Sue and I climbed it on a sunny, breezy June day with Rick and Lindsey, and once we`d managed to park the car and pick our way across a mile of boggy, heathery, boulder-strewn moorland I really began to take to this little hill. For a start, as went easily and gradually upwards traversing onto the grassy north-west shoulder, a path began to materialise. And the mountain felt much bigger than it actually is, almost like a Munro – I guess that`s mainly because you begin almost at sea-level. I couldn`t believe it`s quite a bit lower than any of our Yorkshire `three peaks`! Easily on for the final 500 feet or so to the north-west top – it narrows considerably and gets rocky as you reach the top, and wow, what an impressive sight! 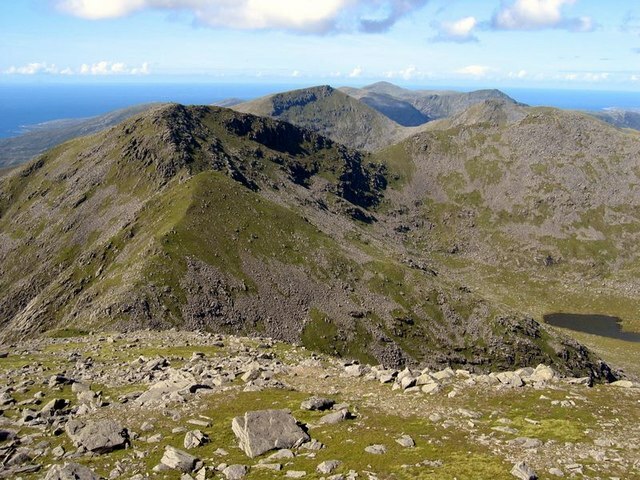 Stretching ahead of you is an exhilarating half mile or so of narrow choppy ridge, grass and rock all mixed up (a bit like a mini Striding Edge) with the summit prow rearing up at the end, plunging vertically down in an awesome cliff to its left and steep grass on the right. Indeed much of the north-eastern face of this hill is pretty vertical with great cliffs belying the mountain`s modest dimensions. Despite the stiff northerly breeze down below things got much calmer the higher we went. The way ahead is much easier than it might look. Pick your way at will – sticking to the crest if you want exhilaration, following bits of path down to the left or right for a less exposed route. As on Striding Edge the path weaves its way in and out around and over the ridge. There`s a lovely sharp grassy pyramid just before the summit where you can scramble up and pretty well hug the top! The final 100 feet or so to the top is on a path up the grass by the `back door`. A big wind-shelter encloses the trig-point on top. What views! Superb panorama all round – back along the ridge, the big precipices and corrie below wild and lonely, the other hills and the sea to east and west, the jagged Cuillins of Rhum and Skye further east, the islands to south and north, and the amazing water-studded flatlands of South Uist all around (“like a jigsaw with lots of pieces missing – and they`re all water”). We could have been adventurous and continued with the complete circuit of all three hills – fairly straightforward, but pretty long and tiring with a big walk out at the end ... next year ... sometime? There's the quick, ordinary way up this mountain – a doddle....... There`s the “I did it properly” way, doing the complete horseshoe, a substantial day out..... Sue and I did – the soft option (well, it was very breezy and there are, we were reliably informed, one or two narrow rocky bits later on....)! 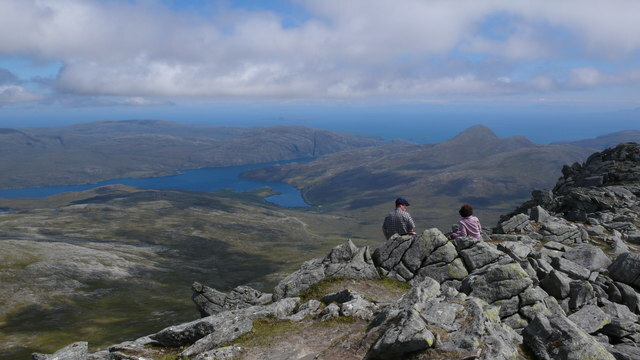 Clisham as you all know is the Corbett of the Outer Hebrides, at just over 2,600 feet the highest point of the archipelago. It`s the right hand point of an impressive group of four mini-ranges spread east to west across North Harris, seen very well from where we were staying with Lindsey and Rick and Phil and Tini at a cottage in Ard Ashaig. We`d delayed attempting this hill all week (the weather...) and this was our last day on Harris.....Halleluia, my hot line worked, and it was a cool clear sunny day! The others were off eagle-searching, so Rick very kindly drove Sue and me four miles or so up the main road to our starting-point, a lay-by where we were already 600 feet up by the River Maaruig (well, a little beck actually). From here it`s just straight up to the top, looking so near and only another 2,000 feet...From here too it`s a neat grassy, bouldery pyramid – very different to the big gentle grey dome you see from the south. Across peaty moorland, a bit damp, for half an hour then slowly upwards where better bits of path take shape. Aim dead centre, keeping to the right of a small rocky bluff higher up. Soon we heard the repeated `peep peeps` of two delightful golden plovers, bobbing up and running from side to side to our left and right – typical `please, please, you`re in our space – THAT way, NOW`! As we neared the top, things steepened and narrowed and got quite rocky. The summit ridge is all spiky rock (slightly reminiscent of those much bigger sharp boulders on the Glyders plateau), narrow - but wide enough to feel secure and to accommodate the big wind-shelter summit cairn a couple of hundred yards ahead of us. The path tracks an easier route just below. As expected, wonderful panoramic views again in every direction, including the ubiquitous Cuillins. The continuation down and across the linking switchback ridge to the other main peak, Mulla-fo-dheas, looked very tempting....but there was that misty low bit of cloud over there, and the fleshpots of Ard Ashaig called. So back down, renewing our friendship with one of the golden plovers (delightfully bold and cheeky), and a short peaceful meditation by a rock-pool and cascade not far from the road.